Fatalities for children age 12 and under due to an auto collision has decreased somewhat over the past ten years. That’s a very good thing. But surprisingly, there were still more than 9,000 children who died in a car collision during that same time period, according to the CDC. What is even more distressing, while the overall rate of children who were not buckled up when an auto collision occurred is about 35 percent, nearly half of all black and Hispanic children who were killed in car collisions were not buckled up. Improper use of restraints in car accidents should be a major concern for all parents. Laws requiring parents and others to buckle up their children when they get into a vehicle have resulted in more children wearing safety restraints, however there remains a full third of those children who die in car collisions who were not protected by being buckled into their car seat. All 50 states, as well as the District of Columbia have child safety seat laws which require children to travel in approved child restraints or booster seats, although some states do permit young children to use adult safety belts. Some parts of the country had much worse fatality rates than others, with the majority (52 percent) of children who were in fatal car crashes living in the south. For reasons not easily explained, states with red light cameras had lower child fatality rates from car collisions. Since red light camera laws are typically instituted at the municipal level, this finding could be of particular interest. Research on red light cameras typically finds that the cameras tend to decrease the number of intersection collisions, particularly those which are known as “right angle” collisions. Most of the child safety seat laws are “primary,” which means the police can stop the driver solely for a violation of the child safety seat law—in other words, if a police officer observes a toddler climbing over the back seat while the car is in motion, the officer can stop the driver for that reason alone. In states such as Nebraska and Ohio, child safety seats are considered secondary enforcement laws, meaning the officer must have another reason to make the initial stop. Child safety seat laws do result in more children being buckled up—among the five states which require parents to have their children buckled into a car seat or booster seat until the age of 7 or 8, the use of child car seats and booster seats effectively tripled, while fatalities and serious injuries among children age 8 and younger decreased by at least 17 percent. Currently, only two states—Wyoming and Tennessee have child restraint laws which require the use of a booster seat or car seat for all children aged 8 and younger. Unfortunately, there are thousands of children at risk on today’s roadways simply because they are not buckled up; one in three children who died in a car crash in 2011 was not properly restrained. Further, more children (45 percent) between the ages of 8 and 12 are not routinely buckled up, one-third of children between the ages of 1 and 7 are not buckled up, and a full 25 percent of infants under a year old were either not buckled up or buckled incorrectly. It is particularly important that car seats and booster seats are appropriate for the child’s age as well as his or size. Child restraint systems are often used incorrectly—in fact about 46 percent of car and booster seats are misused in a way that could severely affect their effectiveness. Whenever possible, children who are 12 or younger should sit in the back seat rather than the front, to avoid injury by a front airbag. For infants and toddlers who are in a rear-facing car seat, the seat should never, ever be placed in front of an airbag. Children should be buckled in every single time they are in a vehicle, with no exceptions. 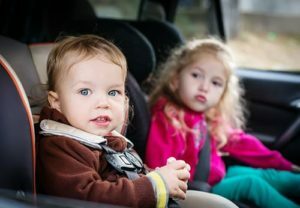 Far too many children are injured or killed in an accident which occurs when mom or dad is running a short errand, and doesn’t take the time to buckle the child or ensure he or she is buckled. Finally, car seats and booster seats should always be installed and used according to the owner’s manual. At the Green Law Firm, we want everyone to be safe on the roads – and that includes properly using seatbelts and car seats. If you are injured in a car accident, however, contact the Green Law Firm today to begin building your case. Contact the experienced car accident attorneys at the Green Law Firm today to schedule a no-obligation consultation and discuss your case. Call us today at 1-719-694-8515.